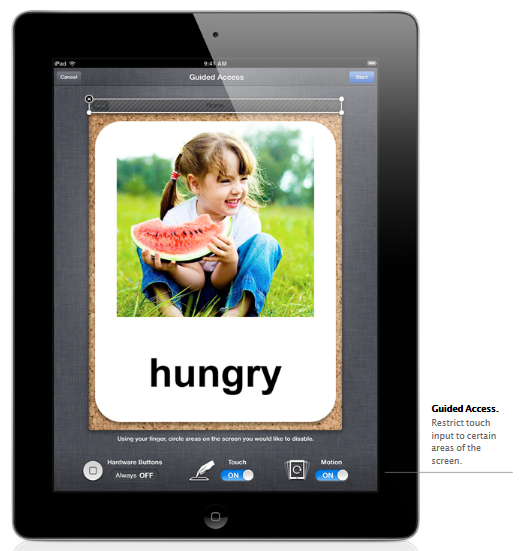 iOS 6 Accessibility Features – More Options for Individuals with Disabilities! iOS 6’s projected upgraded features for fall, were announced by Apple providing many new exciting features supporting individuals with disabilities. Visit Luis Perez’ post for his expert overview of the iOS 6 at: http://luisperezonline.com/2012/06/12/ios-6-accessibility-features-overview/ . The new iOS 6 upgrade is exciting news for iDevice users and service providers who have or are working with individuals with disabilities. Wow, so many possibilities! How exciting it is to be able to apply these features to clients we work with to remove barriers as well as making life easier for ourselves! Keep your device up to date to be ready for iOS 6 this fall! This entry was posted in Accessibility, Computer Utilities, iOS, iPad, iPad Management, iPhone, iPod, Mobility Impairment, Occupational Therapy and tagged Accessibility, iOS accessibility, iPad, iPhone, iPod, iPod/iPad Management, occupational therapy. Bookmark the permalink. 2 Responses to iOS 6 Accessibility Features – More Options for Individuals with Disabilities! Our Cerebral Palsy community has been eagerly awaiting this update! Thank you for posting this information. Updated list has been repaired. Tech difficulties (actually technician difficulties)! Thank you for visiting. I will look forward to checking out the Cerebral Palsy Family Network!